This 1987 pencil sketch is one of the originals I recently sold. “Sleeping Beauty” always hung over my desk until I took her down to Chartiers Custom Pet Cremation to hang in the living room for others to see at that important moment in their lives with their pets. I brought it back and took the sketch out of its frame and replaced the glass for a little chip in a corner, and rescanned the original to have a better final digital image than the one I had. Holding this sketch in my hand, looking at the details with no glass between us 32 years after I’d finished it, all the other art that came after this sketch, because of this sketch, was a very happy reunion. I sketched my Sally in soft smudgy pencil over 30 years ago. 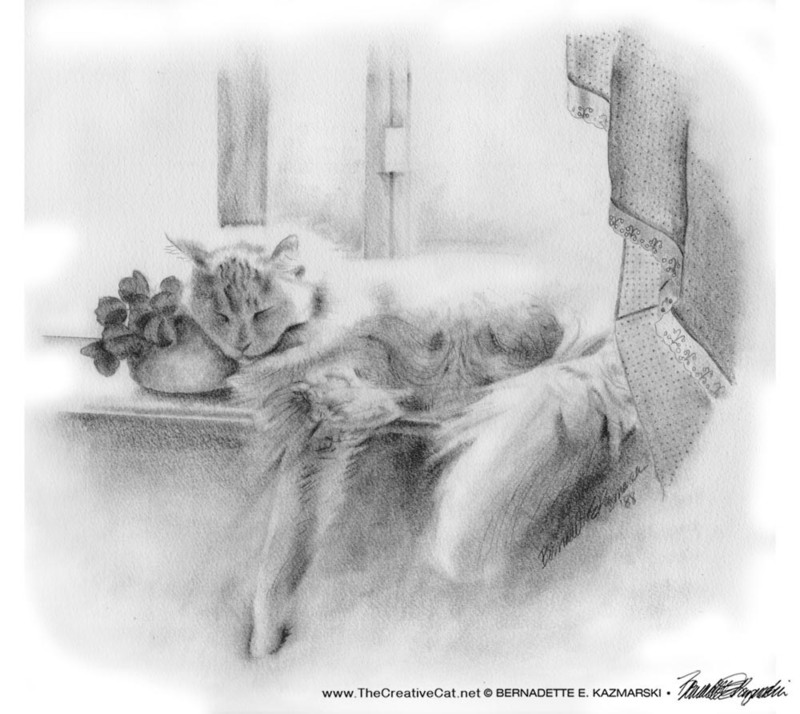 This pencil sketch is meaningful to me as a rescuer, a cat guardian, and as an artist and its impact on my confidence and career, and even though my color works get much more attention they would not exist without this sketch. Up to this point I was still working in pencil, but for the most part was putting my drawing paper over a photo on my light table and copying the image underneath in pencil strokes and smudges, but I longed to set my hands free of all the things that kept me from seeing my visualization, the image I really wanted to draw. This sketch was the first time I looked at a scene, took in all the necessary details, visualized the finished work, and actually created what I had visualized on the paper. This is what has to happen for anything I render, whether it’s a commissioned portrait from photographs or a drawing en plein air. I took the reference photo for this sketch in midsummer 1986 and as the same time of year rolled around again in 1987 I decided I’d had enough practice tracing images in pencil that I could free myself of all the assistance and sketch what I was envisioning in that summer photo of Sally sleeping on the kitchen windowsill with her head on the Swedish ivy, the dotted Swiss ruffled curtain cascading down next to her lush and full tail, one paw gracefully draped as far as it would reach off the windowsill. Though I moved from that place in 1990 and Sally left this existence 20 years ago I can still see her on that windowsill as if she was napping downstairs in my current kitchen. The visualization was that strong, and I stepped away from all the tracing and rulers, lightboxes and special erasers that helped me keep the image in perspective and correct. I wanted to follow the line of Sally’s back with my eyes, to sketch and smudge her fur as if I could feel it, and then to add the dotted curtain and its eyelet lace trim, and do it all without outlines, with positive and negative space. I had never done any of this but boldly experimented with my newfound confidence. And I wanted softened edges that faded out to nothing; I didn’t want a full scene, I wanted just the important parts so I could show other people how beautiful Sally was in a way that photos could not. I had a large sheet of textured watercolor paper that would keep pencil lines softened, and, looking at the photo, began to sketch her face, then to add shadows and shading with the side of the pencil, with a paper stomp to blend, with a Q-tip, my fingers. I had never done this but followed my intuition and referenced Sally in the fur wherever she was as I worked. I have no idea how long it took me. As I mentioned above, I have sold this original to another cat rescuer who follows us, who said it reminded her of one of her cats. For years in Chartiers Custom Pet Cremation’s “living room”, where people gather to say goodbye to their pet or receive back their cremains, it gave me great joy to know that Sally was there to offer comfort to people in a time of grief. Now Peaches will be there for them. The original “Sleeping Beauty” was not always for sale, not until I was sure I’d learned all I needed from it. But I don’t create my art for me, and I am very sad when I don’t get the chance to share it. Knowing Sally will sleep in a home that loves this image fills my heart. I also offer giclée, digital and canvas prints of this sketch, and can always have prints made for you in other sizes. I can also custom frame your print or custom cut a mat for a frame you already own. The original is matted with an oval mat. ← Daily Sketch Reprise: We’re Going Outside, Right?